Last weekend was my daughter's ballet recital. 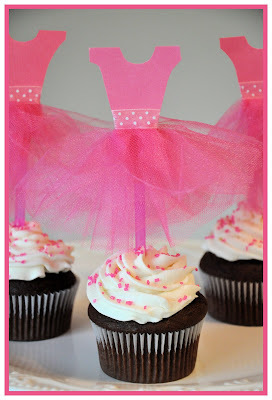 The day before the recital I found a link on One Pretty Thing for these cupcake toppers. The idea came from a blog called Composing Hallelujah. Click HERE to go to Composing Hallelujah for the cupcake topper tutorial. She actually made her dresses out of tissue paper. It was a rainy day and I didn't want to go to the store so I just used what I had on hand. I used tulle instead of tissue paper and pink straws instead of sucker sticks. This is also the reason I didn't bake them in cuter paper cups. :) I followed the same directions though. I was surprised at how easy these were to make.You can also make matching invitations by following the same directions except don't add the back skirt and tape the bodice and front skirt to a blank card or folded piece of card stock. You could also attach these to gift bags. Another think you could do is use white card stock for the bodice and white tulle for the skirt to make wedding dresses for a bridal shower. My friend's sister-in-law made the wands for the girls. She cut wooden dowels into 12" pieces. Then she hot glued and twisted satin and sheer ribbons around the dowels. She tied jingle bells to some heavy strings and put the strings about 3 or 4 inches down the dowels before she finished twisting the ribbon around them. (To secure them) The three strings with bells were all different lengths about 1" apart. Then she hot glued a bow and jingle bell to the top. She also made some with small sea shells. The song the were dancing to was about shells and bells. I can't remember the name of the song but these wands went really cute with it and the girls loved them.